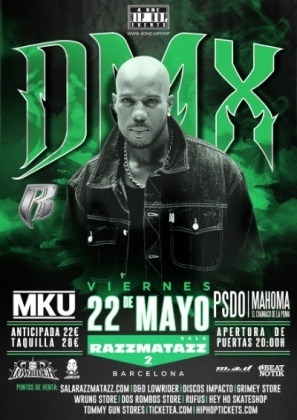 The musician from Baltimore will have a show in Sala Razzmatazz, Barcelona next May 22 (the show was originally on My 24, but there was a change, and your other tickets are valid for this new date). This will be the first time of the artist in Spain after a popular poll. Don't miss this special and unique chance for getting to assist to one of the Hip-Hop events of the year in Barcelona. Earl Simmons (born December 18, 1970), better known by his stage names DMX and Dark Man X, is an American rapper and actor. In 1999, DMX released his best-selling album ...And Then There Was X, which featured the hit single "Party Up (Up in Here)". He has acted in films such as Belly, Romeo Must Die, Exit Wounds, Cradle 2 The Grave, and Last Hour. In 2006, he starred in the reality television series DMX: Soul of a Man, which was primarily aired on the BET cable television network. In 2003, DMX published a book of his memoirs entitled, E.A.R.L. : The Autobiography of DMX. DMX has sold over 30 million records worldwide, making him one of the best-selling hip-hop artists of all time.